Start with your material preference. The material you choose should accent your kitchen decor and provide a backdrop for it. Whether you select granite, marble, glass, or steel, your backsplash should look as if it belongs in your kitchen. Consider functionality carefully. From coverage to appearance, make sure that your backsplash does what you need it to do. First and foremost, your backsplash should provide protection along the stove, the sink, and other areas where you intend to prepare food within your kitchen. Hire a professional. While you may think you can do it yourself, hire a professional to do the hard work for you. A professional backsplash installer can make sure the tile are aligned perfectly and that any supporting structures are properly prepared before installation begins. 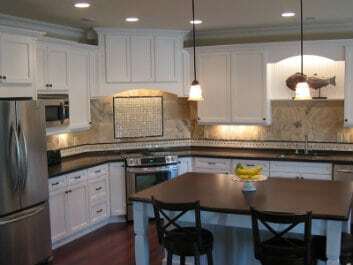 Our team would be happy to help you select the perfect backsplash tile for your kitchen. We invite you to contact us at Conestoga Tile today to learn more about the options and tile installation services we can offer you.